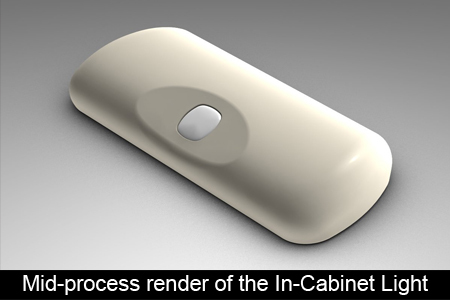 The In-Cabinet Light began humbly as number 26 on a list of product ideas maintained by Jenesis International’s president Brad Jensen. The entry, hand written on a worn spiral notebook reads “kitchen cabinet LED light.” From these beginnings the In-Cabinet Light has become one of the most popular Jenesis products and is the product most commonly found in the homes of the very Jenesis employees who created it. Like many of Jenesis’ products the In-Cabinet Light was not the first of its kind. Similar items were already in stores across the country. Still, Brad and Jenesis’ lead engineers Kim and Roger felt they could do better. They focused their attention on the mechanism for detecting an open door. Existing products used cumbersome magnetic switches, battery intensive ultrasonic systems, or restrictive infrared sensors. Instead Brad, Kim, and Rodger chose to experiment with an untested solution: a simple, energy efficient, omnidirectional, light sensor. This unexpected triumph demonstrated the value of the new product, but right away a problem emerged. 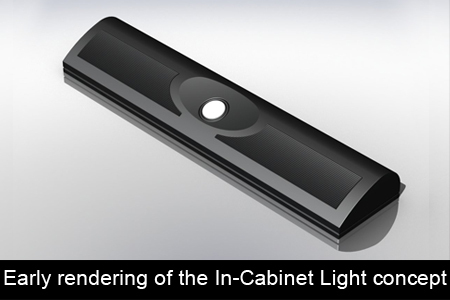 If the light outside the cabinet was dim or if the light leaking into the cabinet was high the light could trigger incorrectly. Kim in particular spent a great deal of time trying to find a signal specific to an open door. Eventually he found a solution that could even tell the difference between the door opening and someone turning the room lights on and off outside the cabinet. However, despite Kim’s best efforts, it was still possible for ambient light levels to be so low that the light couldn’t see the open door. To compensate, a button with a low-glow ring was added, allowing the user to find the light in the dark and turn it on manually. A timer function was also added to turn the light off automatically. With the inner workings in place, the next step was to present the features in a useful and practical way. A combination adhesive/magnet mounting system was selected to simplify installation and to avoid the need to drill screws into cabinets. Mark Goldy, our product engineer, put in a lot of effort arranging the light sensor, on/off switch, and swiveling light fixture in a way that allowed the light to be installed at any angle on any surface. As the light took on its final shape Brad began to realize that the product had potential beyond its original purpose as a wireless kitchen cabinet light. Want to see more? 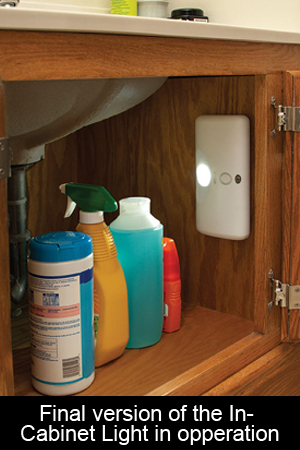 Visit the In-Cabinet Light product page.